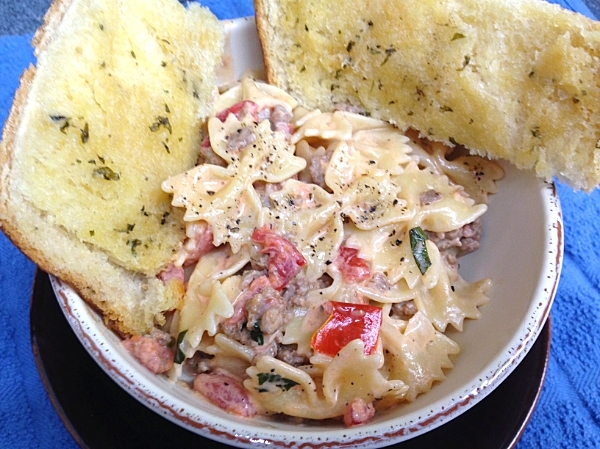 We’re gonna take a step back from BBQ today and go down a little different path…Pasta! This dish holds a very special place in our hearts. It was actually the very first thing I ever cooked for Mrs. G when we were dating. It was also my first attempt at cooking it. I don’t know what I was thinking…cooking a dish for her that I had never cooked before? Luckily, it was a big hit and has graced our table on countless occasions since. She considers it one of her favorites to this day (I know because I overheard her telling her Mom about it when I was cooking it the other night). So much so that she requested it for her birthday this week. How can you deny a Birthday Girl her request? And yes, if you are following along, Mrs. G and I have birthdays in the same week, 3 days apart. Well, actually 368 days apart if you want to be technical. This is a very simple dish to execute and only takes about 30 minutes to prepare. Super easy, yet packed full of flavors. 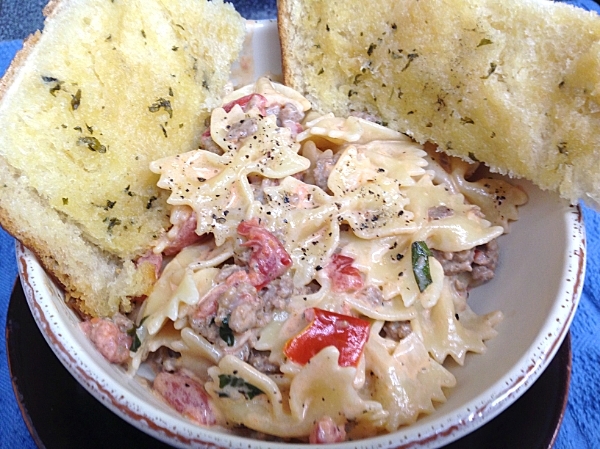 You can take it up a level by including homemade Hot Italian Sausage, but it’s not necessary. Store bought will work just as well. 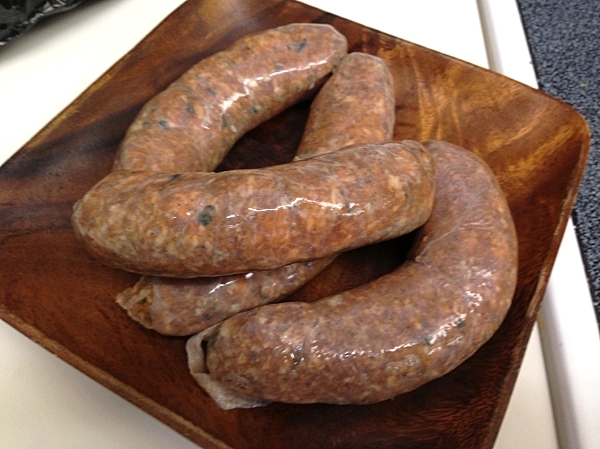 If you can’t find bulk sausage, buy the links, slit open the casings and pull out the meat. 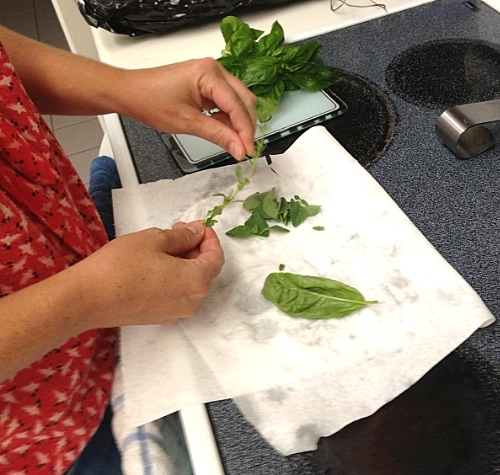 Adding fresh herbs to your dishes really enhances the flavor, especially if they are picked from your garden moments before. While pasta is cooking, heat a tbsp or so of oil in a large, deep skillet over medium heat. 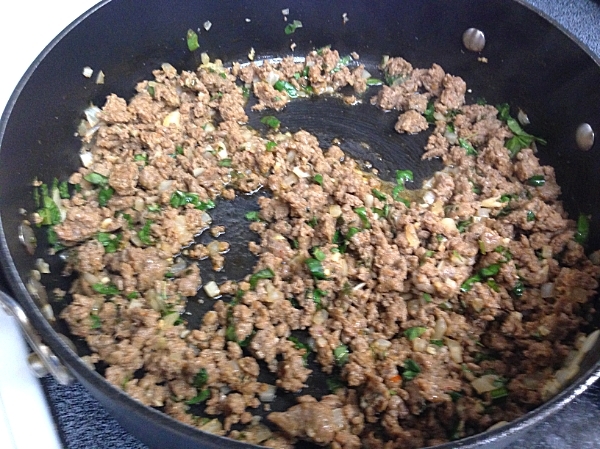 Cook sausage (and pepper flakes if using sweet Italian sausage) until sausage is evenly brown. Stir in onion and garlic, and cook until onion is tender. 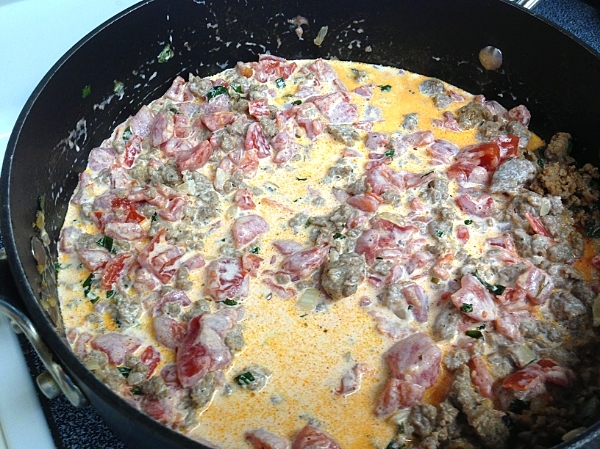 Stir in fresh basil and oregano, tomatoes, cream, and salt. Simmer until mixture thickens, 8 to 10 minutes. Stir cooked pasta into sauce, and heat through. Sprinkle with fresh basil and Parmesan cheese before serving. By this time, your house should have the enticing aromas of an Italian kitchen from cooking the sausage, onions, garlic and basil. Taste the sauce now while it is simmering and make any adjustments you feel are necessary. 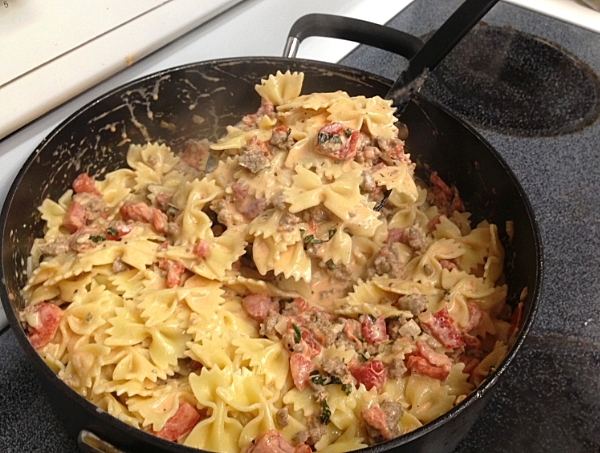 Once the farfalle is al dente and the sauce has thickened up, add the drained pasta directly to the sauce. This isn’t one of those pasta dishes you want to ladle on top of the pasta. 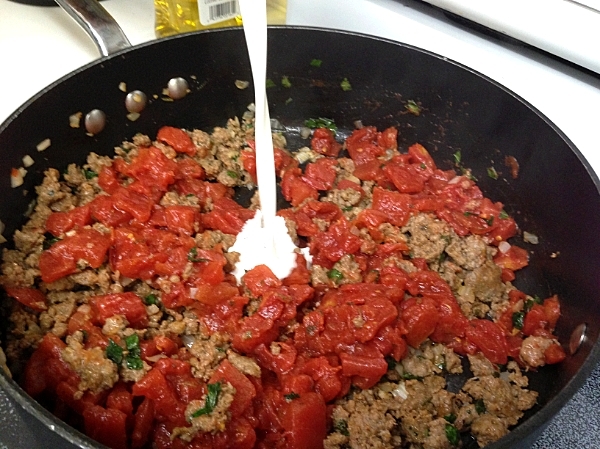 You want the sauce to cover all the surface area and nooks and crannies of the pasta. Don’t forget to grate some fresh Parmesan cheese on top and sprinkle on some basil for garnish. How can you resist a bowl of pasta that looks like that? I can’t say whether cooking this dish for Mrs. G caused her to fall in love with me or not, but I like to think it helped increase my appeal in her eyes. Like I mentioned before, we’ve cooked it on numerous occasions and every time, we think back fondly to that first night I cooked for her. It might not be the most fancy or most complex of dishes, but it will always hold a place in our hearts. We hope you enjoy it as much as we have. Nothing. Not a thing. Not saying that you can’t add things to tailor it to your tastes or to use up things in your pantry. We’ve altered it before by adding mushrooms, black olives and/or even artichokes, each adding a unique twist to the dish. But it doesn’t need it. It works fine just the way it is. Take it, experiment with it and make it your own. Very nice. We love pasta too. Not as much as grilled stuff from the egg, but pasta is close to the top of favorite things. Thank you very much, Katherine. 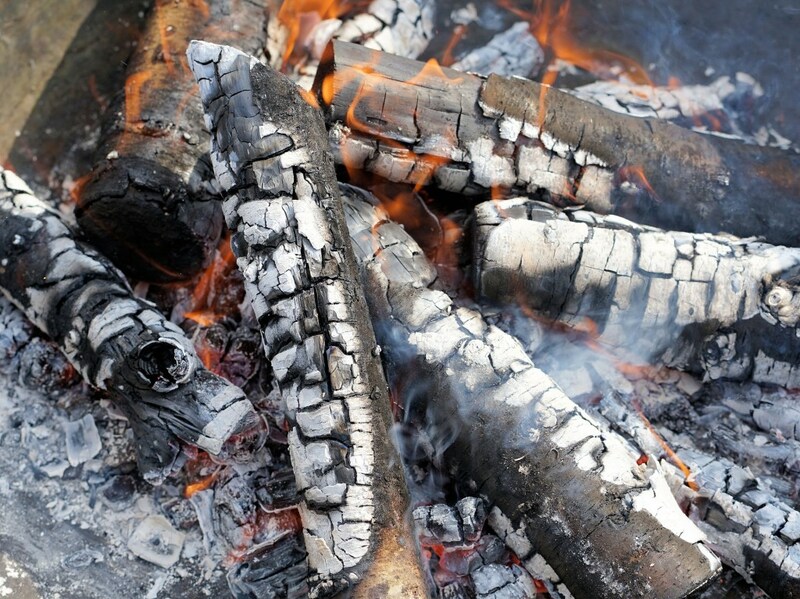 As much as we love BBQ and grilled food, sometimes you just want something else. Mrs. G loves pasta and I gotta keep her happy. I’ve got to make this, it looks delicious. Right up my street! Thanks for sharing. Let me know what you think of it, Dewi. Its one of our favorites. Yet so tasty! Some of my favorite dishes are the simple ones. Thank you. Looks yummy. Happy birthday to you both! Dude…….that is just fantastic! Seriously good. I made this dish last night and it was a hit wiht my family. Thanks for sharing. What I modified – doubled the onion and garlic. My wife’s suggestion is add more tomatoe’s. Glad everybody liked it. Some recipes are so easy to adapt to meet individual tastes, this is one of them. I often adapt recipes, too. You are very welcome, Robin. It is one of our favorites, partly because it is so good and partyly because it was the first thing I ever cooked my wife when we first started dating. You’ve reminded me that its been too long since I’ve made it for her so thank you. Thank you. I’m glad you like it. This recipe has a special place in our hears as it was the first thing I cooked for my wife when we were dating.